You know winter has arrived when the slight chill in the air turns into a biting cold. The cold weather is the perfect excuse to stay indoors and snuggle under the covers. However, winters aren’t just about quite mornings and lazy afternoons. It is the perfect season for travellers, and explorers to venture out and experience the beautiful snow-capped mountain ranges and valleys. Winters in Finland are absolutely magical, especially around the vast northern area of Lapland. Home to Santa Claus, it is the perfect place to spend your Christmas holidays. 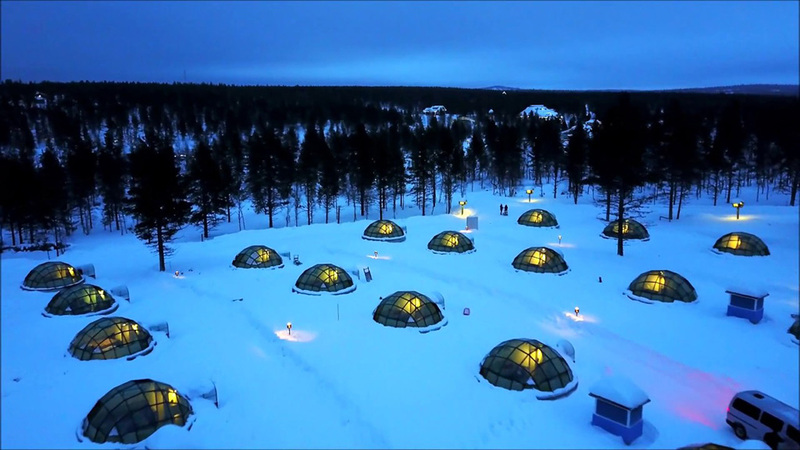 Hotel Kakslauttanen Igloo West Village situated in Lapland, Finland is a serene and peaceful vacation spot that gives travelers the authentic winter experience in short span of time. Admire the Northern Lights, stay in real igloos and enjoy the chilly mornings with a hot Finnish sauna- can winters BE any better! Read on to know more about the place and reasons why it makes a great vacationing spot. The mere mention of Lapland conjures all sorts of mythical images, folklore and thoughts. The Kakslauttanen Arctic Resort is located about 155 miles north of the Arctic Circle, set on either side of the Lapland highway all the way up to the North Cape. The resort is open all year round except for the month of May. 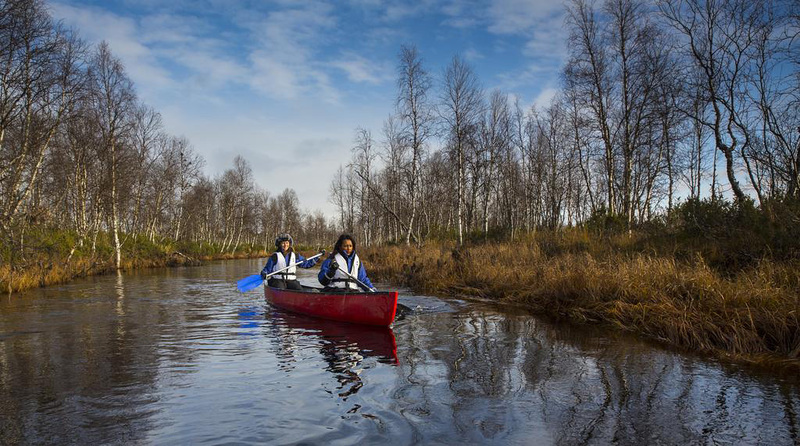 Guests drop in all throughout the year to enjoy the varying seasons and adventures that Lapland has to offer. 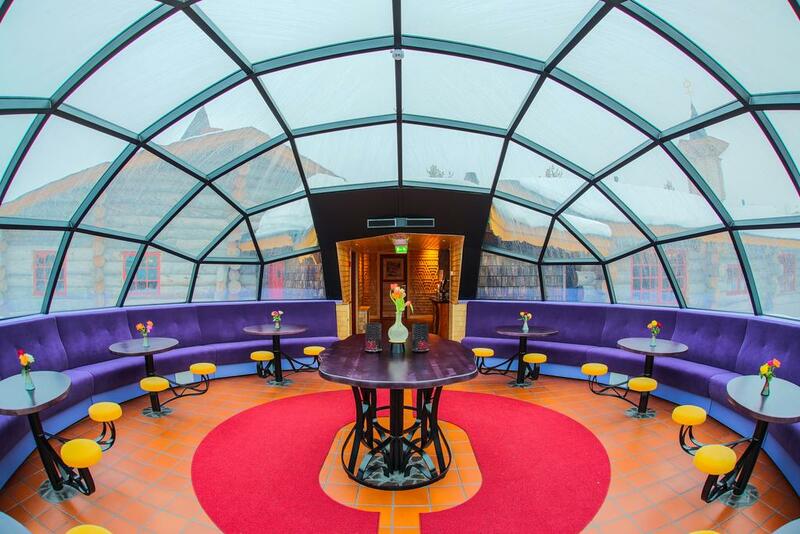 Kakslauttanen Igloo West Village started out as two separate villages that now work as one resort. Kakslauttanen Arctic Resort is well-connected to the main city and all the major motorways and airports. The hotel even offers pick-up services from the Ivalo airport, which is a 30-minute, drive away. Occupying two sites in the northbound Lapland, the resort gives you one of the best views of the Northern Lights and the midnight sun. Kakslauttanen Igloo West Village has come a long way from the humble little cluster of the villages that it was a couple years ago. Back then there were two separate villages, namely the East and the West “Villages” that comprised of log cabins, igloos and snow and wood accommodations. The story of the Kakslauttanen begins sometime in the summer of 1973, when Jussi (the founding father of the resort) was on a fishing trip somewhere in the Utsjoki, a village located far north. It just so happened that he ran out of fuel ion the way back and had to spend the night in a turf-roof cabin in the middle of nowhere. Jussi, for reasons unknown for strangely attracted to this place (apparently called the Kakslauttanen) and spend his subsequent summers there. What started out as a small tent soon became a chalet and gradually a café where weary travelers could rest and enjoy a hot beverage after a tedious journey. 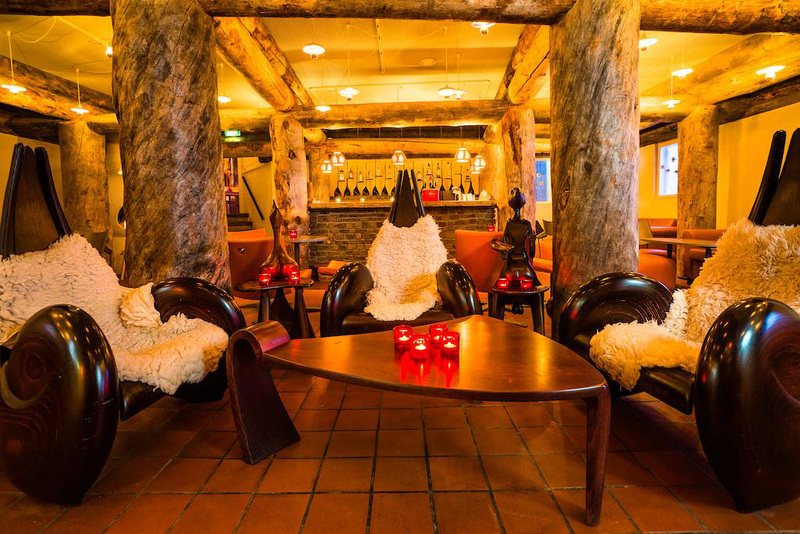 Over the years the Kakslauttanen Igloo West Village slowly came into being and is today one of Finland’s most popular travel businesses. And for all its elegance and grandeur, the Kakslauttanen Arctic Resort is at its heart, a home for weary travelers looking for some magic. The Kakslauttanen Igloo West Village is not your conventional winter holiday home. 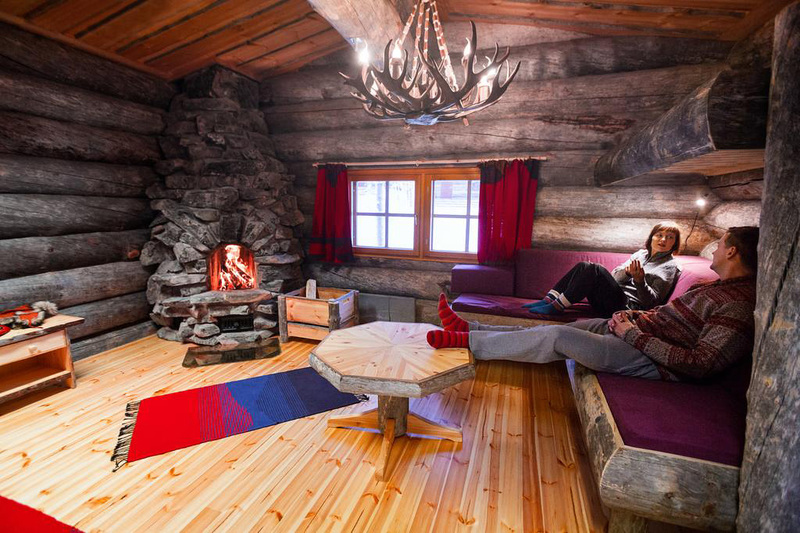 For, unlike other luxury resorts and cabins, this Finnish wonder offers you a simple, warm and authentic experience of the northern hemisphere. The entire ice village is designed in two separate parts- the East wing and the West Wing. The original Kakslauttanen cabin where JussiEiramo took refuge is now a roadside cafe that remains in the East Village. Other than that the East wing also consists of traditional wood cabins, a reception, eating houses, glass igloos and even snow igloos during winters. The West village started out as a Santa Claus themed resort but has now developed into a glorious celebration hall. 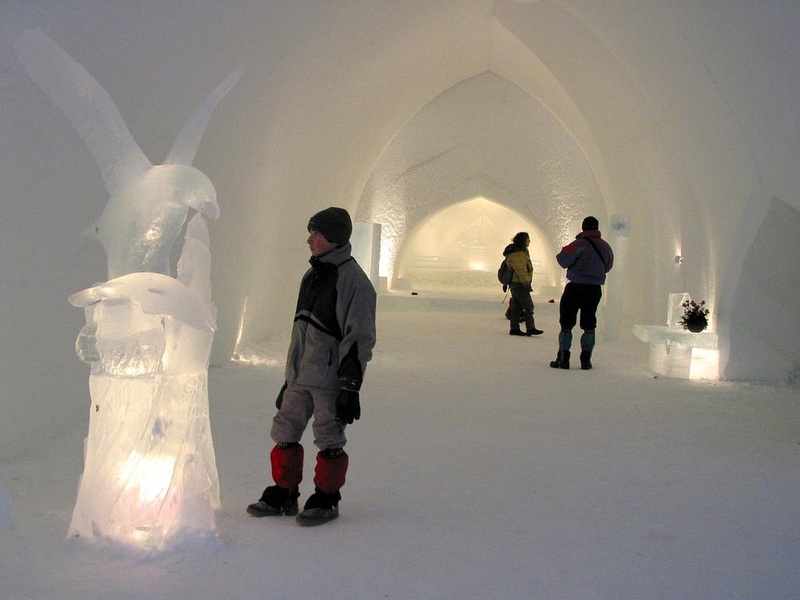 The place is peppered with ice sculptures, a magical Santa Claus house, new restaurants, ingenious igloos and cozy log cabins. Intricate wooden carvings, outdoor lighting houses, log lanterns and glass roofs add on to the aesthetics of the place. 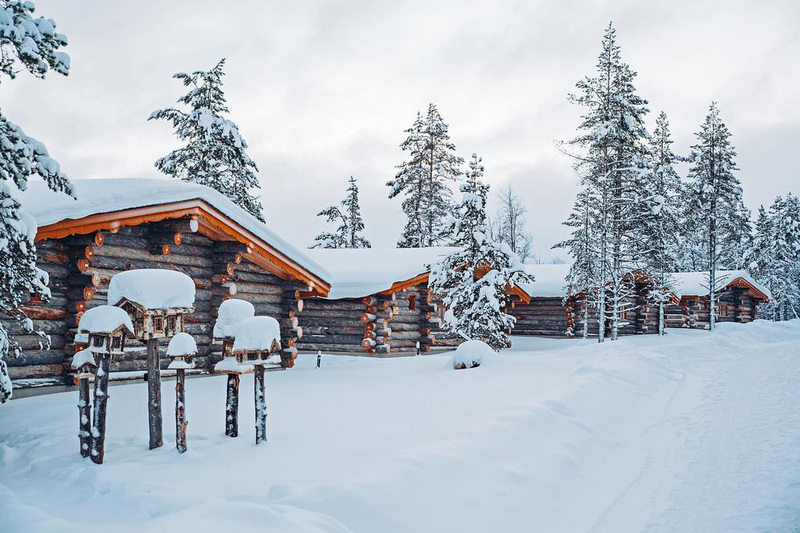 Both the East and the West village include log houses, glass igloos, snow igloos and wooden cabins built to accommodate families, solo travelers, and couples. The chalets at the West Wing can house 10 people in bunks beds and two large double beds comfortably. The log cabins are pretty basic and minimalistic with an open fireplace, a sauna, and shower. There aren’t any modern-day electronics around like TVs and music players. And although the place does offer Wi-Fi connectivity, guests are encouraged to forsake it and instead just enjoy the surrounding wilderness. The glass igloos are a popular accommodation available all throughout the Northern Lights season (from 24th August to the end of April). These structures are made from thermal glass that regulates the temperature inside the igloo and also offers you a stunning view of the northern skyline. Saunas and showers are available in a separate building. The queen suites of the Eastern Wing are far more luxurious with their four-poster beds, bathtubs, and private saunas. 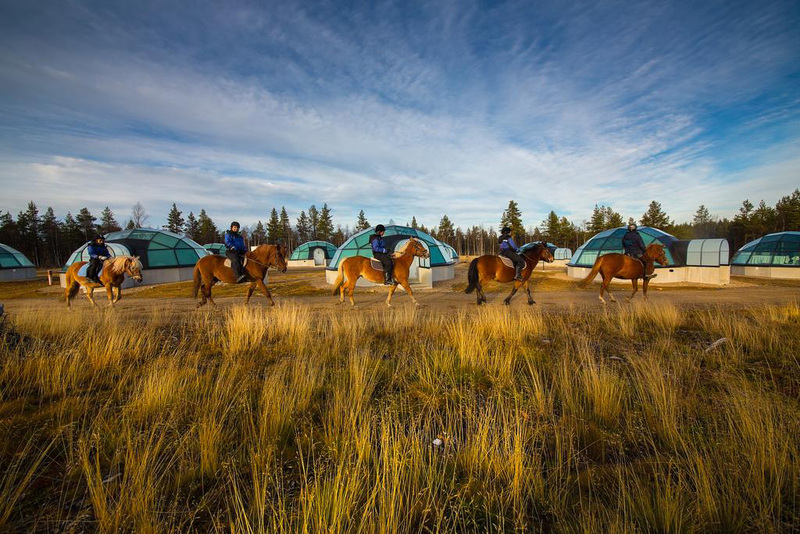 The best thing about the resort is its strategic location that gives you a panoramic view of the Northern Lights and the Midnight Sun right from inside the glass igloos. However, don’t stay holed up all day! There are loads of things to do around here. The hotel arranges for special tours around the forests and nearby settlements. Other than that there are husky sled safaris, reindeer sled rides, and expeditions on snowmobiles that gives you an opportunity to explore the flora and fauna of Finland. The cozy warm accommodations complete with a private sauna feels heavenly after a tedious day of sightseeing. On a particularly snowy day, you can check out the many attractions inside the resort premises. The Santa Claus house and celebration halls feature intricate and delicate ice sculptures, log lanterns and aesthetic wooden art carvings. 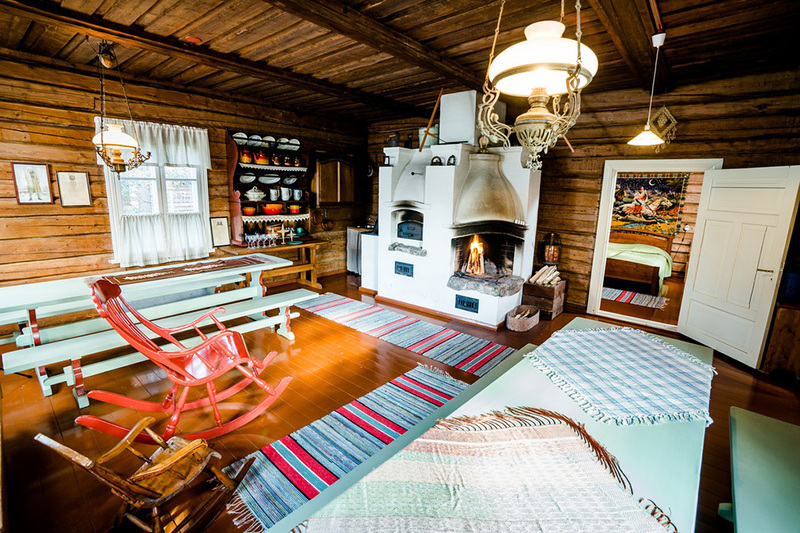 The authentic smoke saunas are quintessentially Finnish and feel absolutely heavenly. You can even pay a visit to the reindeer farms and husky kennels. There is never a dull moment at the Kakslauttanen Igloo West Village! Finland is one of the safest countries in the world right now and is a great destination for families, couples, and solo travelers. Located smack in the middle of the wilderness along the road to the Arctic Sea, the Kakslauttanen Igloo West Village is as natural and primitive as it can get. The resort is but a stone’s throw away from the Urho Kekkonen National Park where you can find reindeers, wolves, bears and other Arctic wildlife thriving in abundance. The clean, pollution free and isolated location is perfect for people who want to get away from their dull routines and experience the joys of nature. The land of Lapland covers the northernmost regions of Finland that are mostly occupied by the Sami tribes. 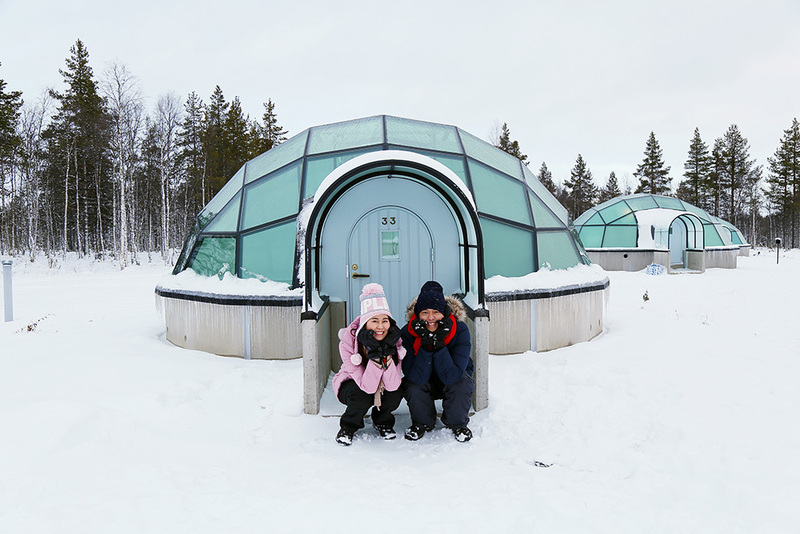 Explore the nearby settlements and learn more about the history and heritage of Finland at Kakslauttanen Igloo West Village. It is placed right in the zone for an optimal view of the mysterious aurora borealis or Northern Lights. The resort has a total of 6 smoke saunas, an open fireplace and an ice pool where you can cool off. 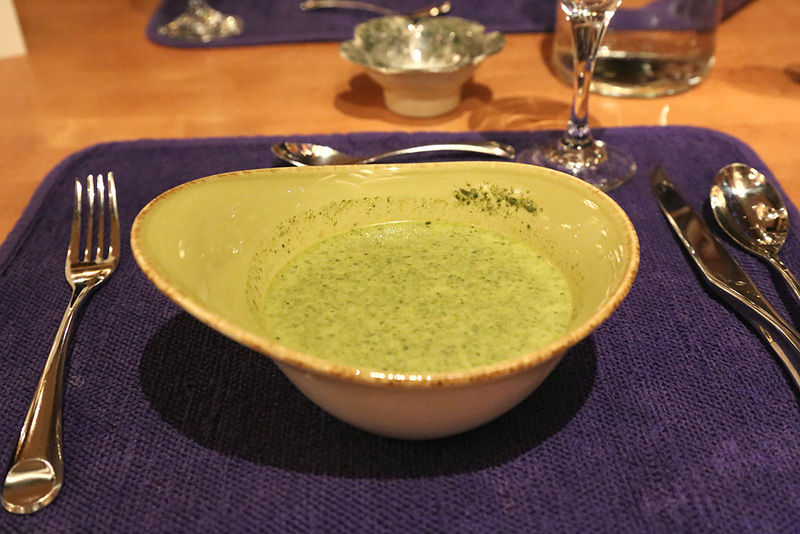 There are two eating houses other than the café located in the East Village that serves the best of Laplandic flavors. Snowmobiles, skis, walking sticks, shoes, sleds and other thermal accessories and clothing are available for rent. Pets are allowed on request although additional charges may apply. The reception is manned by multilingual staff, all extremely friendly and cooperative. Imagine staying up late inside a glass igloo lying under the stars and waiting for a glimpse of the magical Northern Lights. 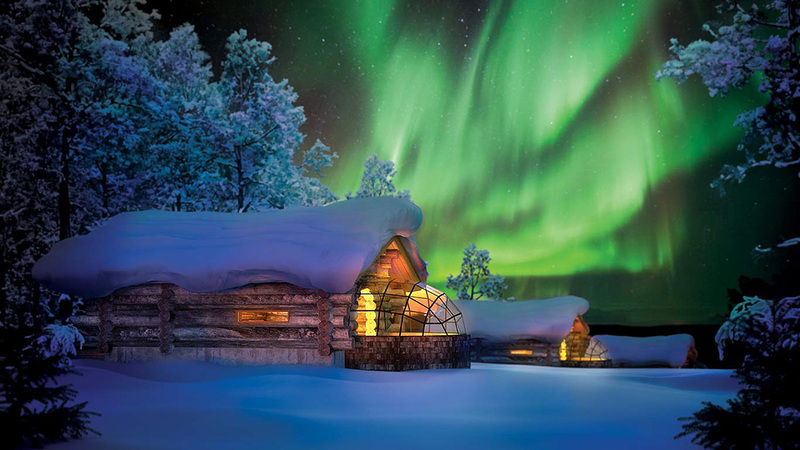 Imagine staying in a little serene ice village entirely made of log cabins and igloos dotting the forests. Imagine snow covered trees and beautiful reindeers roaming wild and free somewhere out there. 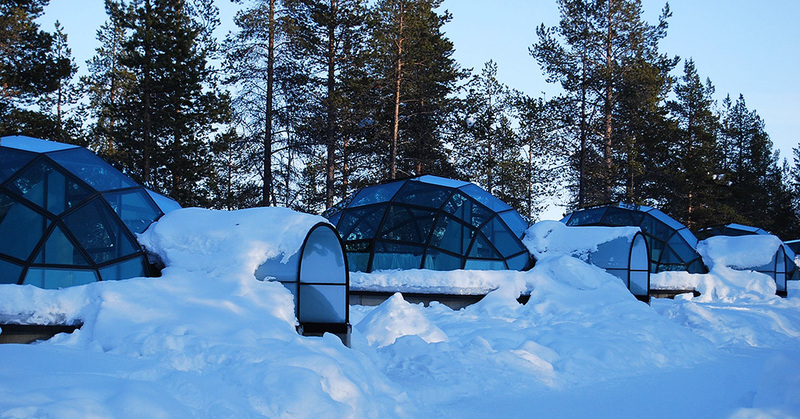 The Kakslauttanen Arctic Resort in Lapland is all that and more. 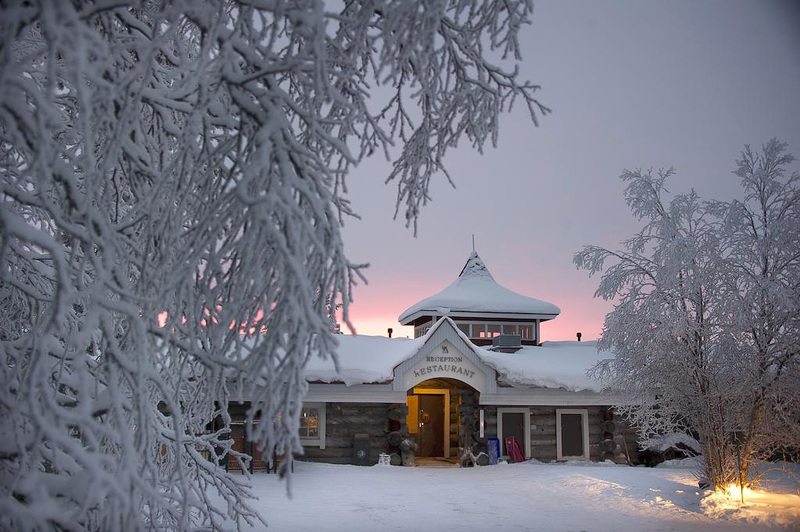 It is your private paradise where a steaming traditional Finnish sauna awaits you after a hectic day of sled safaris and snowboarding. So, this holiday season, chuck the conventional hill stations and sunny beaches for the exciting exhilarating Finnish experience.